Restiffic is a drug-free therapy for Restless Legs Syndrome (RLS), a neurological disorder that causes unpleasant sensations and an irresistible need or urge to move the legs. These sensations typically occur while sleeping or trying to relax. Sensations are described as tingling, itching, burning, or like insects crawling under the skin. 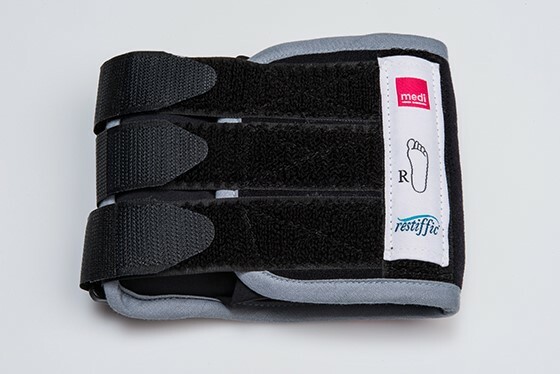 This revolutionary foot wrap works by exerting gentle, soothing pressure to targeted muscles in the foot, reducing uncomfortable impulses in the legs. How can I get Restiffic? Note: Restiffic is a prescription-only, FSA/HSA eligible device. You will need to get a prescription from your healthcare provider or sleep specialist to purchase restiffic. Visit restiffic.com for more information.